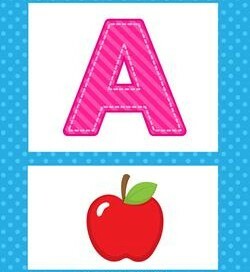 Alphabet posters are a necessity in your kindergarten classroom! Kids need to see the letters with an object that starts with that sound as a reference. This set of alphabet posters includes colorful striped uppercase letters on the top and an object on the bottom. A polka dot blue background ties them all together. 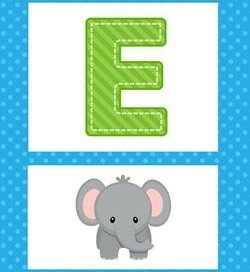 Go to this page to see the coordinating lowercase alphabet posters or this page to see more alphabet letter sets. Look out! Bright colors coming your way! A pink striped A, polka dot blue background, and a red apple come together on this poster for uppercase A.
Beam me down Scottie! 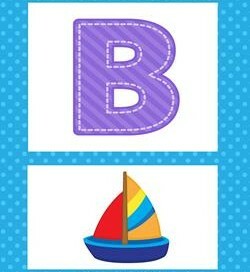 I’ve got to teach kids how to say /b/ and recognize uppercase B. I know … I’ll use this cool uppercase B alphabet poster! 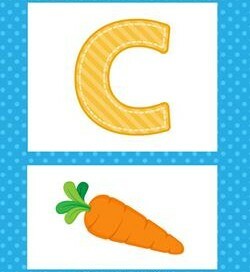 Dangle that carrot in front of your kids, whatever it may be – a warm and rousing “good job” or a hug and a smile for remembering /c/ and uppercase C in this poster. 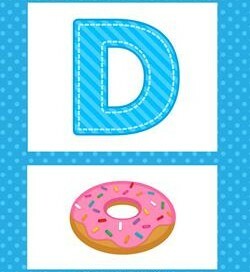 This uppercase D poster has a yummy looking doughnut with pretty pink frosting and colorful sprinkles – served up just for you and your little one(s)! When was the last time you saw a little elephant as cute as this one? 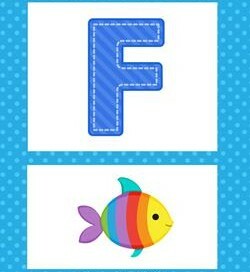 Pair him with this green striped uppercase E and you’ve got an alphabet poster perfect for learning E.
An uppercase F poster with all the colors of the rainbow! Colorful polka dot light blue, striped darker blue and a fishy with rainbow stripes, too! Enjoy! 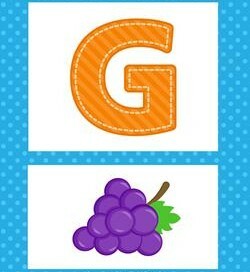 This uppercase golden G is paired with some large purple grapes to represent the sound of /g/ and the letter G. Go girls and guys in remembering G and /g/! What a cute little hipoo! 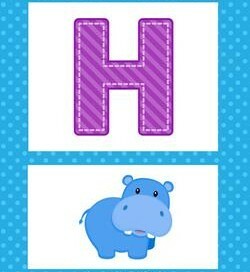 He is here to represent the letter uppercase H on this alphabet poster. Hang it in your classroom! 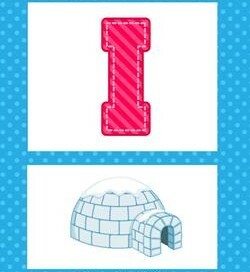 Use it for letter H week and sounding out H words. With an uppercase I dressed in striped hot pink, this alphabet letter can’t help but pop out at you! An icy cold igloo covered with snow is a great reference for /i/. A red jar of jam (or jelly!) compliments a big green uppercase J on this poster. 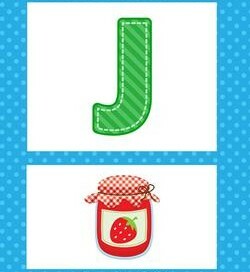 Even though the J and the jam (or jelly!) are in Christmas colors, they still look good on polka dot blue! 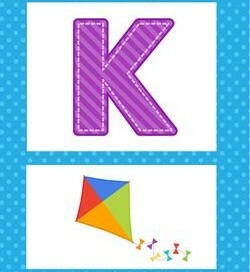 Couldn’t resist pairing an uppercase purple K with a colorful kite on this alphabet poster. Oh, oh, oh … let’s go fly a kite, up to the highest height! Let’s go fly a kite and send it soaring! This sweet little lion certainly wouldn’t hurt a thing. 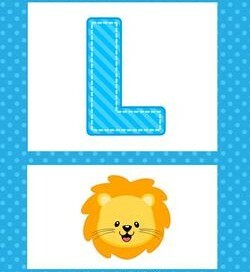 Cheerful and happy, he’s here to encourage kids to remember the uppercase letter L on this poster. 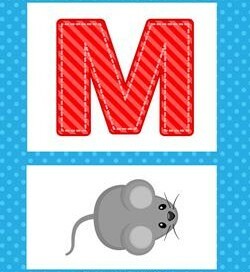 A nice big bold red uppercase M fills the space on this alphabet poster. A big gray mouse (not a computer mouse, though it looks like it cold be) is a reminder of how M sounds. 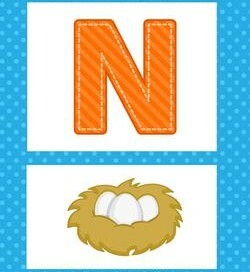 A bright sunny orange uppercase N appears on this alphabet poster accompanied by a nest. Post this where kids can see it and practice the /n/ sound by themselves or together. Whooo! Whooo! Whooo! Who can sound out /o/? 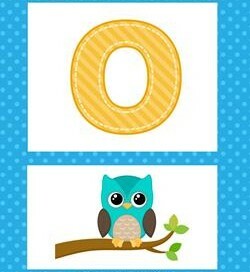 Take a look at this alphabet poster and trace the letter O with your finger in the air while saying the short or long /o/ sound! 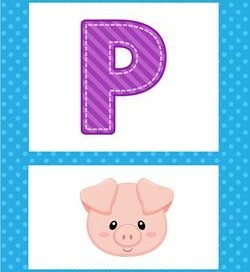 Uppercase P looks like he’s dressed in a striped purple suit so fancy and fine, but with a pig to accompany him on this alphabet poster? Whatever kids need need to remember P!